When are fish good for your brain? When you learn about them at Nerd Nite of course! 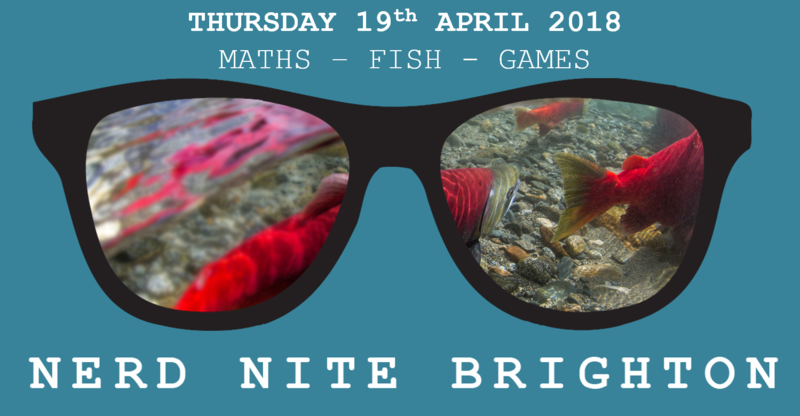 This month we are celebrating recreational maths, migrating fish and the murky world of political board games. All with added cake, beer and quizzing. Be there and be square. We regularly sell out- so if you buy a ticket you can’t use, please let us know on the Facebook page so we can ensure disorganised nerds who forgot to buy a ticket in time can still come. Adam runs the Brighton branch of MathsJam, to the extent that anyone can be said to. MathsJam is a monthly event at which people do/ talk about recreational maths, puzzles, games and similar. Adam did a degree in maths in the UK some time ago, then moved to Rome and joined the recreational maths community in Italy. This led to him contributing to some articles about an obscure Italian gambling myth called the Samaritani Formula (about which he gets occasional hate mail even now). He has run a games and puzzles stand for the University of Pisa Open Week for 15+ years, where students call him “L’Omino dei Giochi” (the little games guy). Given that he doesn’t work for the University of Pisa and his stand bears no resemblance to anything people would do if they signed up there, he is also known as “Pisa University Fraud Department”. Adam is a regular at the annual UK MathsJam, the Gathering for Gardner, and the Recreational Maths Colloquia in Lisbon. He will only tell the barometer story at Nerd Nite if it proves to be absolutely necessary. Kathy Hughes is a freshwater ecologist working for WWF where she works to protect the biodiversity of some of the world’s most wildlife rich rivers. It’s Kathy’s second time at Nerd Nite- she previously spoke about one of her favourite species – the freshwater eel. This time, Kathy is marking World Fish Migration Day (yes, it really exists) on 21st April: a day to celebrate the world’s amazing migratory fish and raise awareness of the need for free and flowing rivers. To complete their life cycle, many species of fish embark on migrations between our rivers and the ocean. Migrations can be thousands of kilometres long and migrating fish have developed an array of physiological and behavioural adaptations to make these journeys possible. This presentation will introduce you to the lives and journeys of some of the most well-known migratory fish such as salmon, lamprey, freshwater eel, giant catfishes and sturgeons. Ben Bailey is a journalist, musician and gamer. The time he spends on each is probably totally out of whack. He runs the SOURCE website and was formerly the listings and reviews editor on the magazine. As well as writing stuff for other publications he also finds the time to play in various bands and once came 4th place in a BMX tournament. His talk explores the strange connections between the murky world of political propaganda and the seemingly innocent pastime of playing board games. Topics include the feminist origins of Monopoly, the disastrous game that Donald Trump made in the 80s all about himself and the family-friendly game from Nazi Germany that even the SS wanted to ban. You will never look at a plastic beaker in the same way. Copyright © 2009 Nerd Nite Brighton. All Rights Reserved.